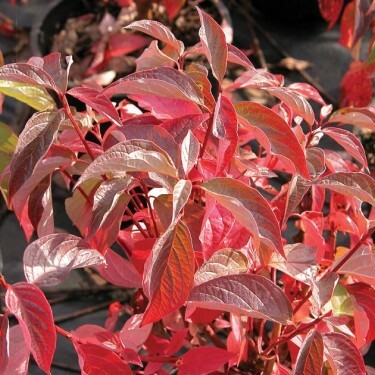 Cornus sericea, commonly known as red twig dogwood produces reddish stems that turn bright red in winter and are particularly showy against a snowy backdrop. The tiny, fragrant, white flowers appear in early summer and are followed by porcelain-blue, ornamental berries that hang on into winter. Bailey's Red Twig is excellent massed or as a singular specimen. It is particularly effective in shrub borders where plants can be combined with evergreens. It is also effective in naturalistic plantings in moist soils where plants can be allowed to spread and form thickets. Plants perform very well in wet locations such as low spots or along streams or ponds where spreading roots can help combat soil erosion.